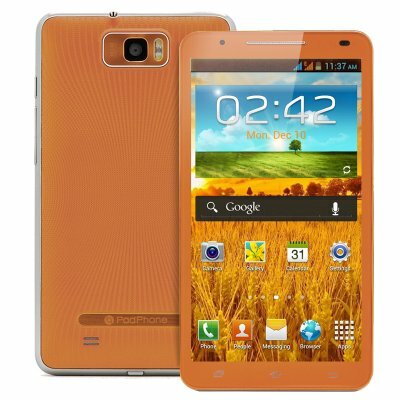 Successfully Added Android 4.0 Phone ''Dune'' - 6 Inch, 1GHz Dual Core CPU, 3G, 8 Megapixel Camera to your Shopping Cart. 6 Inch Android 4.0 Phone with 1GHz Dual Core CPU, 5 point capacitive screen and 8 megapixel camera, bringing together best of both phone and tablet worlds into one great device! The “Dune” Android phone is equipped with a large 6 Inch screen, which allows you to comfortably watch videos, play games and browse the internet while still easily slipping in your pocket. A 1GHz Dual Core processor and 512MB RAM provide enough processing power to smoothly run all your apps and multitasking won’t be a problem at all! This quadband Dual SIM phone operates on both 2G and 3G networks and switching between the two SIM cards can easily be done in the settings of the phone. Keeping your work and private life separated has never been easier! As a Quad Band phone the “Dune” can be used anywhere in the world without problems. With a handy GPS function built in, you’ll always be able to find the best route to your destination and the 8 Megapixel camera lets you snap high resolution pictures. Customize your phone's homescreen like you want and download any of the more than 600.000 apps available from the Google Play store and truely turn the "Dune" into your personal phone. Order this carefully designed Android phone today and we guarantee to ship out your order tomorrow. Backed with a 12 months warranty, this phone is brought to you by Chinavasion, leader in wholesale large screen Android phones. Chinavasion has really outdone themselveswith thisone!!!! I honestly cannot believe the quality of this phone. Ilive in the U.S.and truly speaking it rivals any of the Galaxy or iphones on the market today. It operates smoothly and no issues whatesoever. Just waiting to get my 3G card although I havw WiFi.